Ex TRANSGLOBE is a multi-leg, round the world, adventurous sail training event taking place from July 2015 to August 2016. The exercise is organised by the Joint Services Adventurous Sail Training Centre and will involve two 72-foot Challenger 72 yachts completing a circumnavigation of the globe in 13 legs that will include multiple ocean crossings and participation in the prestigious Sydney to Hobart race. The British Army has been allocated one of the 2 yachts for the duration of the exercise and will crew all the legs with a variety of serving Regular and Reserve personnel from across all cap badges. Private Ashley (Ash) Cooper, from 2 PWRR based in Cyprus, is crewing the third leg of the exercise. Ash is 18 at the moment and will be celebrating his 19th birthday mid Atlantic. Find out how he’s been getting on. As we sail through the eye of a storm on yet another night with oddly nil ambient light, it shows how the weather changes rapidly, with little or no warning at sea. It’s odd because bar yesterdays rain and wind, most days have been bright and sunny and up until recently the moon gave off so much ambient light that it was almost as bright as day, only adding to the beautiful night sky almost mirrored in the vast ocean around our speck of a boat in comparison. Today consisted of another day of sailing as fast as possible to potentially get into Cape Town a day early (providing we average above 7 knots daily) and with us being almost at the half way point of this epic venture, it’s a welcome thought, especially after White watch’s home like cooking of a sausage casserole to warm up crew mates that have come off the deck that was more like a scene of a ship prior to sinking! As the sun sets on another day in the Atlantic, we are grateful for the good weather we have all hoped for after yesterday and last nights strong winds which although couldn’t be felt by those on mother watch, could definitely be felt and endured by those on deck! And with us now over half way, I think all the crew are relived that that spell of weather is over. Today we have found out from various crew family members back in the UK, tracking the two boats, that we are ahead of the RAF/Navy boat “Adventure” by just over 30 nautical miles! Considering that we were 60 miles behind them only a few days ago just shows how hard the Army crew is grafting to get to Cape town before the other boat! Another overcast day in the Atlantic unfortunately, although some good sailing conditions being produced as the day rolled on to the evening and night as a sliver lining. Spirits are still high as we approach South Africa more and more by the day, especially now we are past the half way mark and are still as always, leaving the RAF and Navy in our dust (or in this case spray! ), by about 35 miles tonight which I’m sure will increase in the coming days! Morale aboard is still maintained by plenty of brews being belt fed to those on deck and fresh bread being baked daily. Little things like that can keep crew members happy in this massive ocean. After a few days of rough seas and strong winds and the mother watch and off watch feeling like the numbered balls being selected for the national lottery, it was refreshing to have a few hours of sunlight and relatively flat seas! Even better when it holds out well into the night… Granted the sunlight didn’t last that long, but that’s neither here nor there. With a 65 mile lead on the RN/RAF boat and counting, the marina in Cape Town has never looked so good, especially when at the rate we are going we are going to make it in four days! Which is music to sea salt ridden ears! We can only hope that the weather holds for the remainder of the trip. As much as we all wanted to experience what the South Atlantic could throw at us, we are at the stage of wanting to get our boots back on solid ground! We arrived on Sunday 20th September, everyone settled in well on Discoverer (Challenger 72) and slept on board for our first night as a crew. The first few day were used for admin and getting to know the boat, lessons and sightseeing. Day 2 was used to see Rio’s sights including Christ the Redeemer, Copacabana beach, Sugar loaf Mountain and a social meal to bond as a crew. The following day we started with lessons, followed by a training sail in and around Rio’s harbour so that everyone could get to grips with the boat and the basics of sailing and essential emergency drills. Thursday 24th we prepared the boat for departure and some last minute shopping for supplies. At 1500 local time we slipped berth and sailed into the south Atlantic towards South Africa. As we sail into the ocean the crew are in good spirits and a good amount of healthy competition exists between the two yachts. The crew are grafting well as a team to face this challenge head on as the army always has. Eating dinner is a challenge to say the least, especially at a forty five degree angle! It was a bit of a rough start today for the crew of the Discoverer as large swells engulfed the hull of the boat and large amounts of spray battered the crew until they are like drowned rats! However un-deterred we sailed on. There have been one or two inevitable cases of sea sickness due to the sea state but everyone felt much better when the sea had calmed and the wind had dropped. Spirits are still high on board with light hearted humour still the main pick up of moral. We are averaging speeds of 6-10 knots which is quite good for a crew of mainly novices! As we push on into the night the wind has steadily got stronger, but the sea has remained relatively clam for now; we can only wait to see what tomorrow brings! Such a calm start as the sun rose on a somewhat overcast but peaceful south Atlantic. Most of the day was spent trying to get some speed up to cover more distance with a goosewing (mainsail and headsail on opposite sides of the boat) being rigged towards lunch time. We hit a bit of a snag in our travels around 1400 when the Cunningham snapped off the main sail which in turn had to be taken down for repairs by Chris our sail maker. Luckily we had the sail back up and working before the sea deteriorated and the wind picked up. Admittedly this gave way for some awesome sailing, but it made other jobs such as stowing sails and cooking somewhat difficult to say the least. However all members of the crew are still in high spirits and the healthy banter between crewmates is flowing to keep the morale at the high level it is already. Yet another calm day of mainly motor sailing rather than sailing unfortunately. However the break in the wind and weather has to a certain extent given the crew a brief respite, so mainly washing was done today whilst the spray wasn’t lapping over the guard rails! All the watches are still rotating efficiently, with all cases of sea sickness redundant! Some members of the crew even found the time and the energy to try their luck at a spot of fishing, although not productive at these depths of some 4000; it was a way to pass time and relax between watches. The boat has had a well needed clean and tidy and kit being stowed properly so it’s not in the way of this effective team that bonds more by the day. A good days sailing again today with virtually flat seas and glorious sun shine throughout the day with an average speed of ten knots. We are well on course for our arrival day in Cape Town with the possibility of being a day early at this rate! As it stands we are in a mind blowing 5000m of water (5km from the surface to the bottom) which just shows how vast this ocean is and the variety of potential marine life below that is un aware of our voyage across it. Today has given us our first, albeit brief, encounter with the dolphins of the south Atlantic! This naturally stirred up excitement among the crew and gave us a morale boost to push on with this epic adventure! Sun, sun, sun and more sun aboard the Discoverer today as the weather continues to be glorious. How long this will last isn’t really known but hopes are high it does! The calm sea state and consistent wind makes sailing a breeze and a lot more comfortable than the Navy/Air Force boat to the south who haven’t faired so comfortably with the weather. We are still averaging between 9-10 knots which puts us well on target for Cape Town. Competition between the watches over the cooking is heating up, with more challenging dishes being prepared to outdo the others. This is always good as the remaining crew get some 5 star food! After a long day of sailing and taskings, a hot scoff is exactly the moral boost people need. 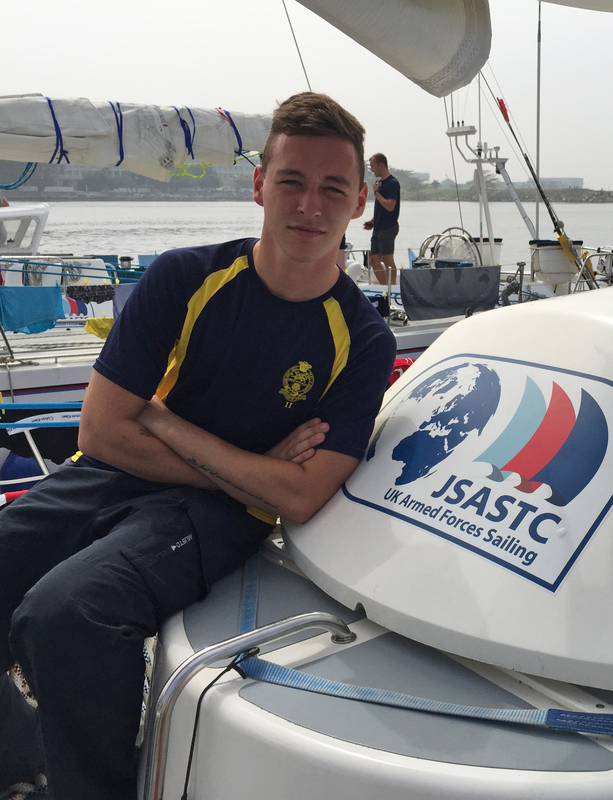 A happy crew today as we discover that the Army is leading Navy/RAF boat in the un-official race across the Atlantic! There is definitely some inter-service rivalry on who will get there first. Naturally my money is on the Army to win, but that would be a bit bias! On a smaller scale, the food competition has definitely been won for now by blue watch with their chicken dish tonight, out doing white watch’s with their millionaire shortbread. The weather has been fair and the same as you have probably read in previous days; the only exception being that it has been a lot hotter today. All the crew are managing to grasp the job of helmsman as we rotate the role through various wind speeds and sea states. I think it’s fair to say everyone is starting to have their sights zeroed on Cape Town more and more by the day. 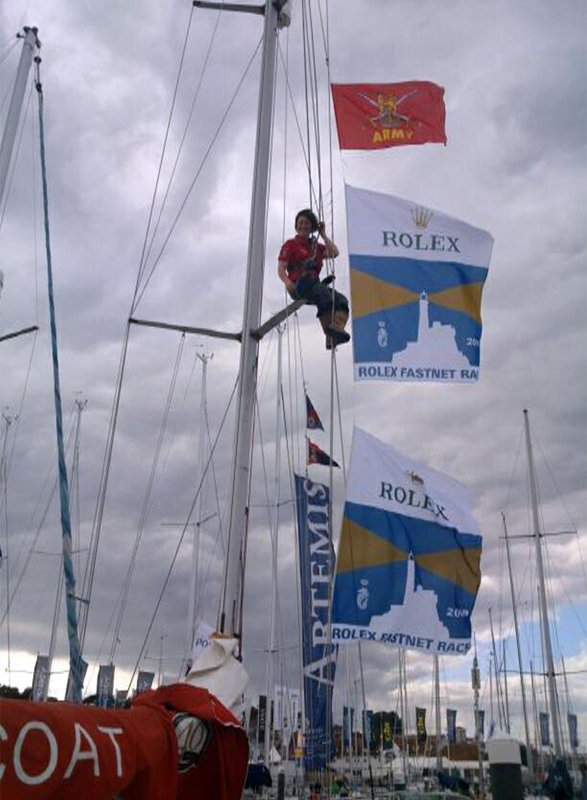 Fastnet update: 18 August 2013 – We finished! Final Update Sunday 18 Aug 13 – Apologies for the gap in blogging due to lack of connectivity and the need for a bit of sleep and cleaning up. 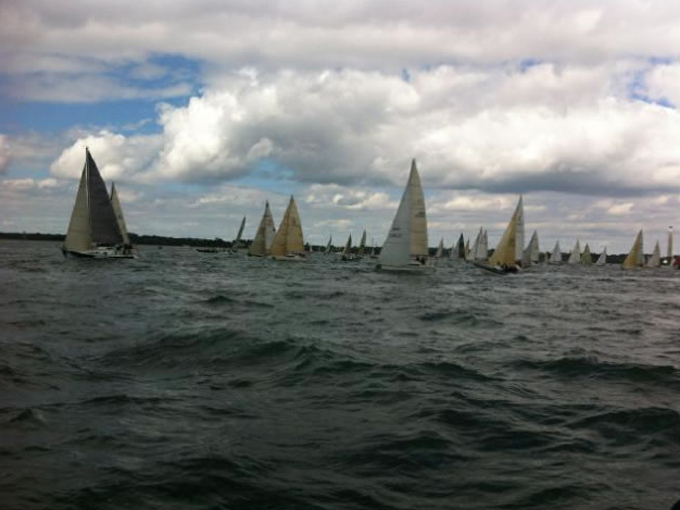 Sunday 11 August: A sea of sails leaving The Solent. Thursday 15 August: Our last couple of hours of the race were somewhat eventful as we had a problem with our spinnaker again but this time is was dark which made things far more difficult. With the finish line only just over two nautical miles away we were so desperate to resolve the issue and continue to the end. It was extremely disappointing for the team to see a number of boats over take; ones that we’d worked so hard to catch up with and overtake during the race; while we battled in the dark to get moving again. The finish line was so near (we could see the lights of Plymouth harbour) yet it seemed so far away and at past midnight we were tired, especially as some of us had only grabbed one hour of sleep since 0400. Friday (16 Aug) morning was spent with a media rep from Andover and another photographer before heading out for a celebratory crew lunch in the sunshine and a chance to relax. We then attended the prize giving and learned that we’d come 57th in our class of 85. We weren’t top of the fleet but for us we had achieved our aim of finishing the race. We then relaxed for a short while before getting the boat ready to slip for Gosport that night at 0100. Gales were brewing and we wanted to get back safely ahead of the weather. Saturday was a long slog back to Gosport and we had to motor initially as there was no wind. After a long race we could have done without the final leg home. There certainly was a lot more wind closer to home with gusts at Force 8! As we came alongside at Joint Services at 2130 we were pleased to have arrived with crew and boat still in one piece. Sunday, was an early 0500 start so that we could get to work and clean Redcoat from top to bottom ready for handing back to Joint Services. Everything was hauled off on to the pontoon and cleaned and the empty boat was scrubbed from top to bottom. The quicker we could get the job done the quicker we could get home to a bath and clean clothes! After our final farewells and debrief from the skipper we were free to go. We have all achieved something as part of this team and will all take away different memories. I feel very lucky to have had the opportunity to complete this event, have made new friends and will remember the highs and lows! Sunday 11 August: Approaching the Needles. Sunday 11 August: Motoring out displaying storm sails before the start. Wednesday 13 August: Approaching the Rock. Update Thu 14 Aug -1330. We rounded the rock at 1315 yesterday and then headed on a steady tack to the Scillies. Last night the weather was mixed with some heavy rain and gusts. 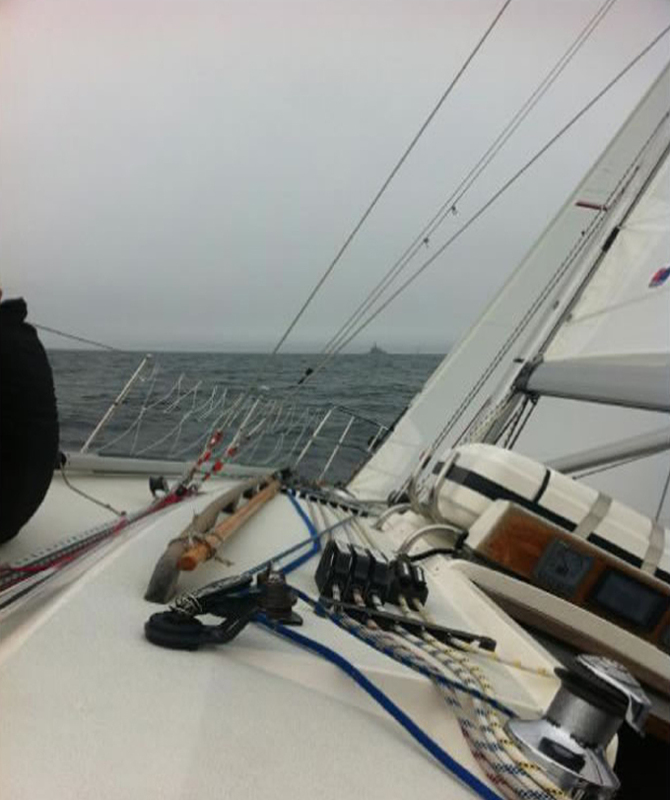 We have been chasing down some distant yachts and are determined to pick up a few places! Our first spinnaker hoist of the event ended abruptly as a tear developed, ripping the. Material to shreds rapidly! We are now sailing under our only spinnaker left ( after a quick patch job after spotting another tear) We have recently rounded the Bishop Rock lighthouse and The Scillies and our making our way to The Lizard. We are all showing signs of fatigue but spirits are up as we hope to reach Plymouth in the early hours of tomorrow morning. Update AM 0630 Tue 13 Aug. We are making steady progress and have been on the same tack for hours, but the wind has dropped and is due to drop further – conditions that do not suit our boat. We need more wind! Sailing at night under the moonlight and stars is always exhilarating. You have to keep a lookout for lights as ships and tankers can creep up upon you very quickly. Watches change every 4 hours and I’m on with Lorna and Sam while Leila, Caz and Emily make up the other watch. The stint between midnight and 0400 always seems to pass the slowest but we are keeping our energy levels up and morale with copious amounts of food. ( perhaps we should rename this race the ‘fatnet’?!) Seriously though, just moving around the boat while heeled over and bouncing through the waves, especially visiting the heads (loo) is hard work as you have to hold on tight and keep your balance. It almost feels like an obstacle course! We are now passing the Isles of Scilly to our West and heading north. My sister and her family live on St Mary’s so I’ve given them a wave 🙂 This morning we were blessed with a beautiful sunrise as dolphins played in our wake and bow. 236 miles covered but a number still to go- somewhat demoralising when we know that some of the bigger yachts will finish today! We arose at 0700 with mixed feelings of excitement and nervousness. We then slipped just after 1000 wearing life jackets and with our storm sails up to queue behind the long line of yachts and progress through the identity gate. Race rules dictate that we have to do this before the race actually starts. The Solent then became a fleet of white sails bobbing around the starting line as skippers inspected which end to start from. This is always a difficult time as all eyes are on deck watching for boats to avoid collisions! Helicopters were swarming overhead filming the start and hearing the radio and starting gun became very difficult. We set off at 1230 and tacked our way out to The Needles passing dozens of spectator boats and crowds of people at Hurst Point. 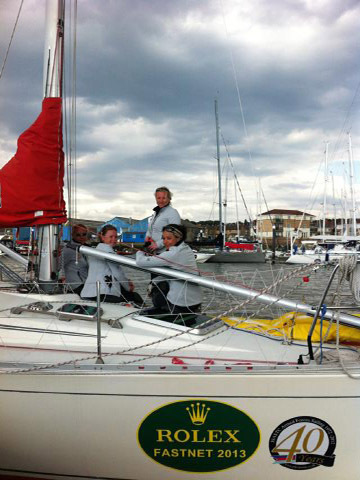 We were tacking every 2-3 minutes for 3 hours so we were pretty ‘pumped’ as we exited the Solent and moved into watches. It was an amazing sight to see all the other boats on the water and we were in awe as the class one huge monohulls and trimarans screamed past us! After a scrumptious home-made ricotta and spinach lasagne made by Lorna and chocolate brownies made by Sam we sailed through the night and are now heading to Start Point near Plymouth. Winds are hovering around 11 knots and we have completed 110 miles. Morale is high! 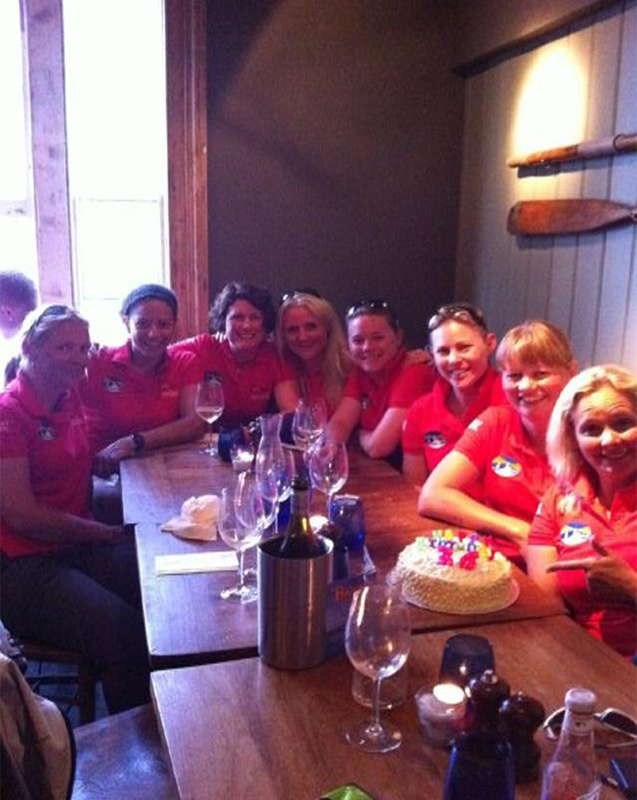 Fastnet update: 10 August 2013 – Caz’s birthday! As Cowes Week has now ended we managed to secure a berth at Cowes Yacht Haven and moved Redcoat down the Medina River to a pontoon with shore power and no need for a paddle in the tender to get ashore. It has been a busy day making final preparations to the boat and reassessing our personal kit and rations required for the event. 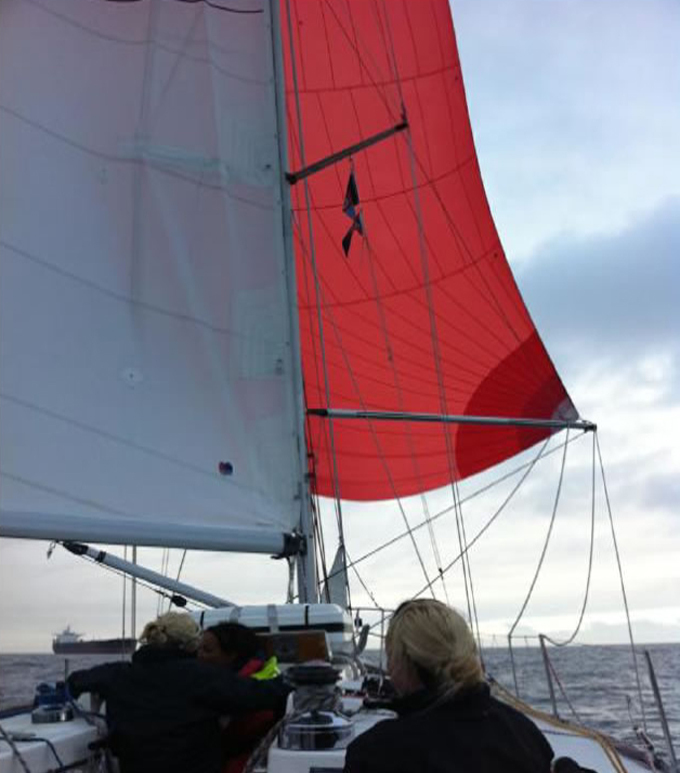 Lucie and Saskia attended the skippers brief and have buried their heads in weather and wind forecasts, various navigational charts and tide atlases working out our route. Getting the navigation right is key and we have every faith in their decision making. Final team meal ashore with cake for Caz. After our final meal ashore and some scrumptious birthday cake made by Sam, we have hit our bunks for an early night. We slip tomorrow at approximately 1030 and our start for IRC class 4 is at 1230. 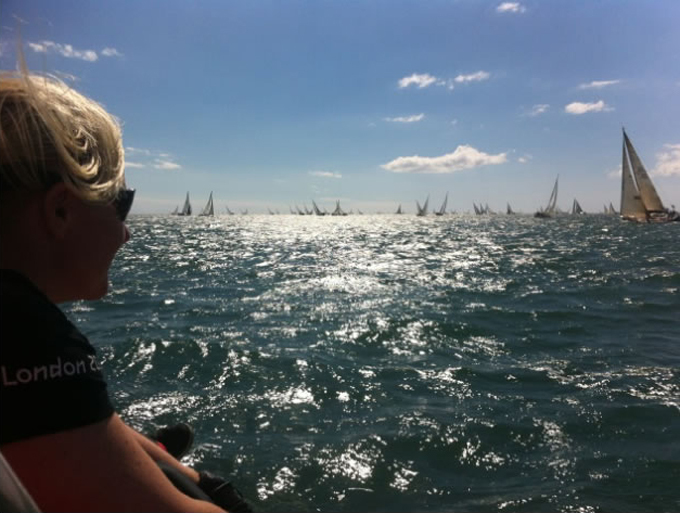 (All starts will be screened live on the RORC Fastnet website.) Thankfully our tracking device is now working after a few hiccups today and everyone will be able to follow us on our journey over the coming days. We are all getting excited now; fingers crossed for a safe finish in Plymouth. Today is ‘victualling and rationalising’ day, i.e. loading up with food and getting rid of excess baggage (and that’s just the crew). Pastry wizard Maj Sam Shephard was dispatched to a nearby kitchen to bake Cornish pasties and coronation turkey with her able sous-chef Maj Leila Greene, while the independent Scottish contingent, Maj Lorna Craik, was tasked with the spinach and ricotta pasta bake. Meanwhile, back on the boat, our ever-cunning skipper, Capt Lucie Allaway, watched with a beady eye while we emptied Redcoat of non-essential items. Out went our electric kettle, saucepans, pillows, the five-year-old box of sugar with the coffee-coated spoon embedded in it like Excalibur… Not to mention personal kit that would not be required: non-sailing shoes, jeans, large bottles of shampoo, seven tubes of toothpaste (one large one should last us the week) and towels (no opportunity to shower during the race!). We also received a small pile of Royal British Legion parcels which contained T-shirts, polo shirts and a flag that would double up as a spinnaker (approximatey 6 by 4 metres). At least nobody will miss us! Final shopping done, and off to Cowes to berth on Whisky pontoon in order to watch the end of Cowes Week fireworks. 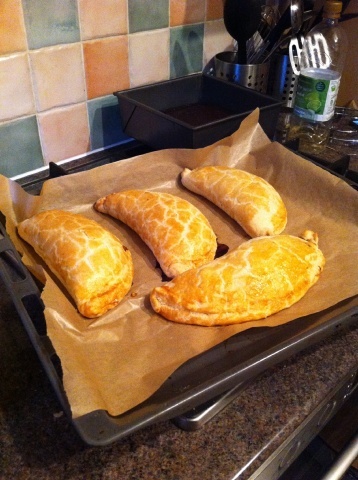 Sam’s yummy home-made pasties to keep up our morale! We enjoyed a more leisurely start this morning, and Emily cooked us some yummy sausage sandwiches because little wind was forecast first thing. 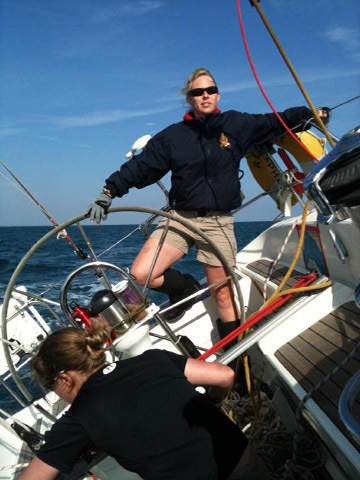 Caz also mended some sails – there are always maintenance jobs to carry out! We then headed out from Cowes and into the Solent to do some more spinnaker work, each time trying to get faster and more slick with out hoisting and dropping drills. Lucie was pleased with our performance, and we anchored up in Osborne Bay for a bit of lunch and a chance to discuss and plan our food menu and shopping for next week. Keeping our energy and hydration levels up will be key. If there is no wind next week, we will have to use the anchor as a brake to reduce the effect of the tide pushing us backwards. Fingers crossed there will be wind – anchor drills are messy and laborious. As we nibbled on lunch, we could see in the distance a fleet of colourful racing spinnakers competing in Cowes week, reminding us that our own race is only three days away… Bring it on! 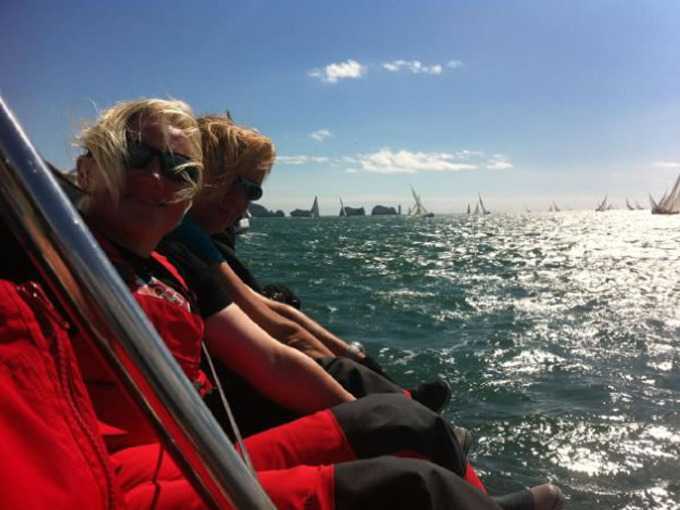 Enjoying the sunshine in the Solent – Lucie at the helm. 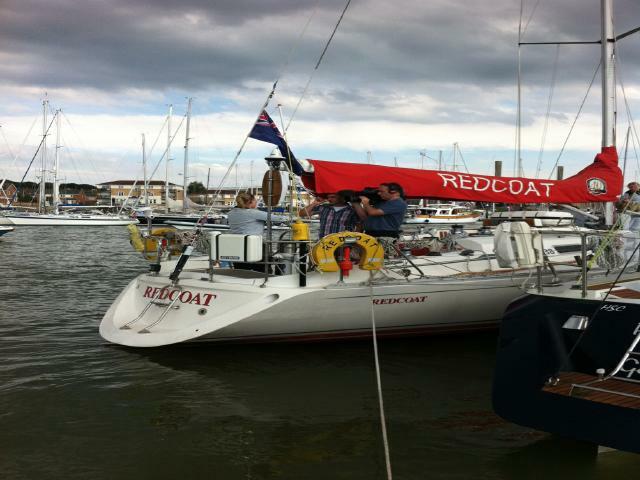 Alongside in Cowes – stickers on ready for the race! 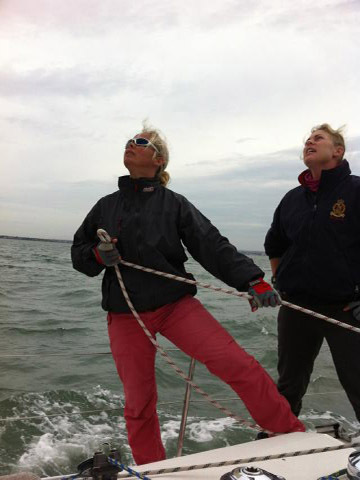 We slipped yesterday from Cowes at 0800 hrs and headed out into the Solent. 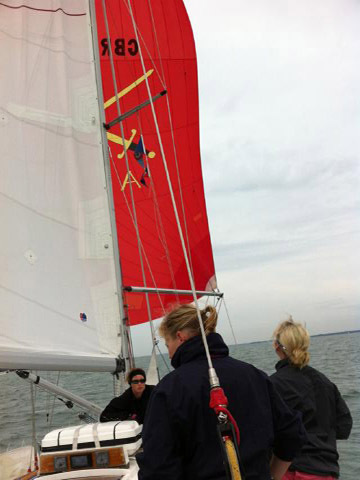 There was very little wind, so we practised some light winds sail trim and spinnaker hoists and drops. 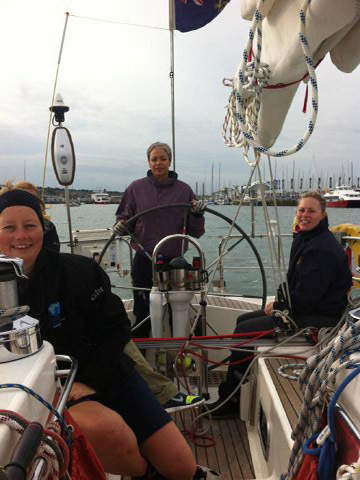 In the afternoon, the British Forces Broadcasting Service (BFBS) and Soldier Magazine visited us in Cowes and interview the skipper Lucie and Leila, Saskia and Caz. We headed out with them into the Solent and they were really happy with the shots and footage they got from the rib kindly lent to us from Toe in the Water. BFBS will put their story out on Friday. After a fun afternoon, we headed out for a crew meal in Cowes.